I’m have over 30 years of experience teaching cello. Every student has different needs; I work with you at whatever point you are at. I have a doctorate in cello. I love teaching cello! I’ve spent 30+ years of my life doing it and I think I’m good at what I do. :) One of the best parts of teaching is connecting you with your dreams. I’m open to teaching music you’ll enjoy playing and I love talking about cello and my love of classical music. I’m happy to help you find music you can play at your level and will love playing. Many of my students find they really enjoy taking lessons with me because I speak their language—I understand their love of different types of music, I hear their frustrations and can help them solve their problems, and I’m happy to spend a few minutes in a lesson “nerding out” about whatever exciting cello-thing came across their radar this week. I have a reputation for students with solid technique who have learned how to solve problems and play in tune, in rhythm, with good sound and musical understanding. Let me help you do so! I’ve taught cello at Clemson University, North Greenville University, Anderson University, and the University of South Carolina, as well as in my private studio. I've been playing since I was 8 years old and teaching since I was 16. I'm a much better teacher than I was 30+ years ago, but I know I've connected with every student in some way and all of them have improved at the cello! 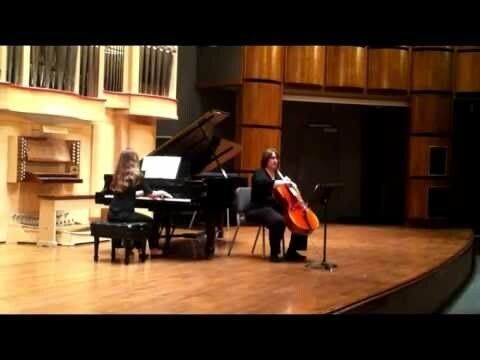 Performing the premiere of a new classical composition for cello and piano. It’s an unusual piece but really wonderful! Just another photo of me! With concert cellist Zuill Bailey. Zuill has played concertos with several orchestras of which I've been a member. With solo cellist Clare Bryant, now the cello professor at the University of South Carolina (successor to my doctoral advisor)! I play an instrument made by NYC-based luthier Jason Viseltear. It has a gorgeous one-piece back made of willow. Wonderful teacher! She was the first private instructor to really understand the way my son learns, and taught him appropriately. He made so much progress under her tutelage. We highly recommend her! First lesson went great. Brenda started me with the basics and was very patient. Answered all my questions. I feel that I will be off to a good start with Brenda guiding me. PS I’m 53 years old, brand new to cello. I’ve always dreamed of playing. I used to play French Horn 40 years ago. Bass clef is all new to me. I originally learned how to play the cello on my own in my school's orchestra. When I went to college and decided to bring my cello with me, I knew it was time to take proper lessons like everyone else. Brenda was able to help me iron out all of the bad habits I had developed over seven years of playing cello with no formal corrections. She clearly cared about me and my interests as a student. I can confidently say Brenda equipped me with the tools, techniques, and attitude I needed to play the cello for the rest of my life. Dr. Leonard has been my daughter's cello teacher for six years. She has been amazing in every way. My daughter has enjoyed playing the cello, in large, part due to Dr. Leonard's teaching style which is intellectually stimulating, humorous, inspiring, and caring. She is a relatable to my teenager. We have never thought of moving to a new teacher because Dr. Leonard always brings something new to the table in her lessons. I wish I could've had the time and money to take another semester of lessons with Dr. Leonard here at NGU. She is a fantastic communicator with brilliant teaching strategies, plus helpful hints and tricks to make a student's learning experience easier. I absolutely loved my time with her, it was a blessing of an experience I'll never forget. Dr. Leonard is an excellent teacher! She genuinely cares about the student and does not hesitate to answer any questions the student may have! She is efficient with her time without making the student feel rushed or as though they have a time limit. Most of all, she is enthusiastic and kind, making her a wonderful teacher! I have studied with Dr. Brenda Leonard for the duration of my college career, and recently performed my senior recital as a Music Education major. Dr. Leonard is not only one of the most accomplished performers I have known personally, but is a truly superb educator. She holds her students to an appropriate standard of excellence in their playing and gives them the support to attain it, adjusting her teaching style based on the needs of each student. Furthermore, she blends down-to-earth practicality with artistry better than anyone I know. Dr. Leonard not only teaches the cello excellently, but invests in her students' lives personally. It has truly been a pleasure studying with her as a mentor.